The PCB keypad has the capacitive touch sensor pads on the top side of the PCB and the necessary capacitive touch driver electronics on the reverse side. 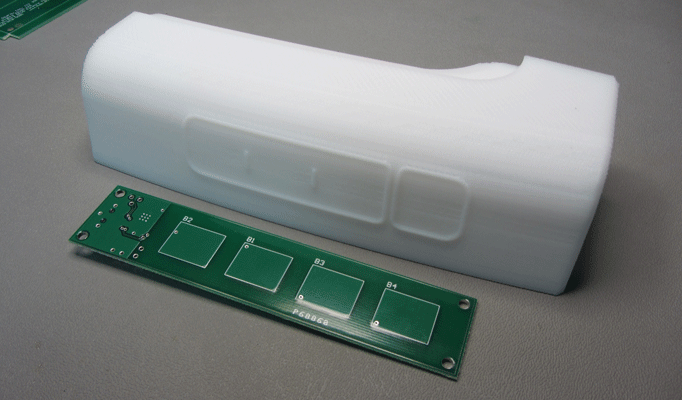 The graphic overlay is attached to the PCB with adhesive or mechanically. The graphic overlay material could be glass, lexan, acrylic or any other plastic of various thickness. The main requirement of the touch overlay is that it must be non-conductive. There are other methods of making "touch" work with metal overlays. If you are interested in this, please contact us. When the human hand is brought in close proximity to the sensor pads, the capacitance associated with the pad changes. This causes a change in the voltage measured on the pads. This change in voltage is registered as a button press. Schematic Design - PCB Layout, release design to fab. Assemble / Solder PCB Components with our pick and place equipment.